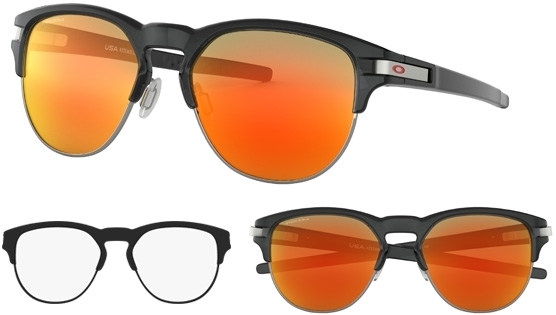 The classically styled men's Oakley Latch Key sunglasses lands a perfect visual delight thanks to stainless steel underwires underpinning semi rimless optical illusion. Available in 2 sizes, the Medium and the Large. Which are you? A new option in the Latch® eyewear collection still delivers the super convenient latch at the hinge that clips to your shirt for simple & stylish on the go stowage, but the extra look that comes with the Latch Key is the stainless steel underwire that drops a faux semi-rimless look. Added style flexibility comes thanks to two frame sizes, a Medium and the Large option, perfect for an optimized fit. Adjustable silicone nose pads on the lightweight and durable O Matter™ frame, you’ll know what true comfort feels like. All Oakley lenses offer HDO® Technology with the following benefits. Clarity: Conventional lenses can magnify images. HDO® precision gives less distorted vision across the entire field of view and Refraction: With regular lenses, objects aren’t really where you see them. HDO® offers a truer visual image so your brain won’t have to work overtime.